I’d recommend the book. With my recent focus on mindfulness, it definitely hit me at the right point in my life. Some bits feel a little repetitive. It is pretty much all variations on the theme of identifying and doing only the essential things. I do love the real life stories of people putting this into practice. There is a lot of good stuff there. But that isn’t what I want to talk about today. Bear with me for a minute. I’m probably butchering this a little bit because I don’t have the book in front of me. Aside: I always forget whether it is bear or bare. Totally is bear. Which makes me think what a weird expression it is. Yes, I get the “endure with me” meaning. But just know that I’m kind of giggling about thinking about us hanging out with bears. In the book, McKeown also talks about forming new habits. Habits can be hard to change. Instead of tackling the habit, tackle changing your cues. This is what triggers the habit AKA your routine. For example, the act of sitting at your desk could be your “cue” to check your email. Instead of just trying to tackle the email habit, focus on the cue/trigger. In this case, sitting down at your desk. Make that cue mean something else. Or get a new cue. I think. Like I said, fuzzy. I’ve been trying to focus on my cues to overhaul my evening routine. For example, getting the kids into bed is my cue to get myself ready for bed. This has several advantages for me. If I get ready earlier, I’m more likely to floss and wash my face, things I’m admittedly bad at doing. Also, it makes me more conscious of the time. If I wait until 10:00 pm to get ready, I don’t notice how long it takes me and I stay up later than I mean to. If I do it earlier, the time is already built into the evening. I see it more if that makes sense. Getting ready earlier also has the added benefits of fewer hours in my contacts, something I’m trying to work on, and I won’t snack if I’ve already brushed my teeth. Getting ready for bed should then be the cue for putting on the kettle for tea. Waiting for the kettle should be my cue for checking in with my planner and thinking about the coming days. It’s not perfect. But I’m working on it. I have found that some cues work better than others. For awhile now, I’ve wanted to plank more. It seems simple, right? I’m home a lot of the time. Just randomly start dropping 30 second planks. I don’t know why, but they just don’t happen. I need a cue. I tried to make trips to the bathroom a cue to do a plank. It isn’t working. I think because the bathroom is only close to non plank-friendly surfaces. I’m not going to plank on tile. Also, the hallway outside the bathroom is marble. Once I walk past these surfaces, my mind has already been pulled into a million different directions. I need a better cue. Still looking for it. I’m focusing on the evening routine right now, but I just listened to Pat Flynn’s podcast with Hal Elrod. (My sister–the Essentialism sister–recommended Flynn, and I’m currently trying to inhale his whole body of work.) Hal Elrod’s book The Miracle Morning makes me excited to tackle my morning routine next. For 3/4 of the days this week, I’ve managed meditation and exercise, but it sounds like I can do even better. 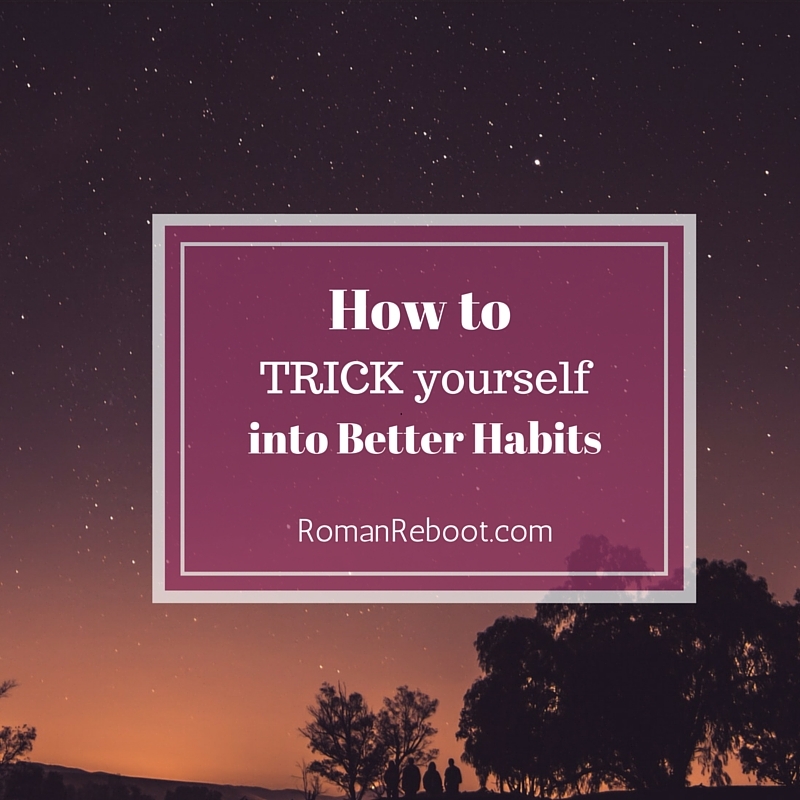 Any habits you are trying to change? What cues do you use to trigger your good habits? Which sister? (just curious.) Love your stuff! Now I’ve got to go find this book and read it. (I’m trying to read 12 nonfiction books this year and this sounds like a good one.) I never thought about looking at the cues but I will give it a try. Let me know if you find others you’d recommend! I’ve almost finished up a post on books, and I’m on the hunt for my next reads.